MANILA, Philippines - Gaon chart, Korea's version of the Billboard charts, released the single and album rankings for K-pop for the month of May. TaeTiSeo, the subunit of Girls Generation, topped the singles and album rankings. In the album sales for May, TaeTiSeo's "Twinkle" mini-album sold 139,388 copies to top the chart. The group has won 12 awards on TV music shows in Korea. 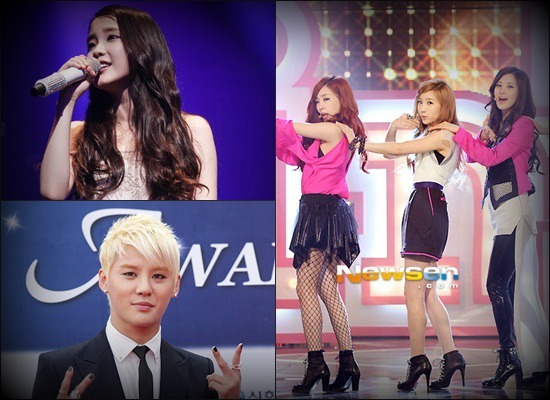 It was followed by JYJ member Xia Junsu's first solo album "Tarantallegra," which sold 122,000 copies. The album grabbed the second spot despite that Junsu did not hold any TV promotion due to the current TV ban on JYJ. Boy band Infinite's third mini-album "Infinitize" is third with 88,284. The boy band has so far won six K-pop chart awards on TV music shows since the album was released last May 15. Busker Busker's "Busker Busker" came at fourth with 32,838 copies sold followed by IU's "Spring of a Twenty Year Old" with 30,975, B1A4's "Ignition Special Album" with 28,053, Ulala Session's "Ulala Sensation" with 24,497, EXO-K's first mini-album "Mama" with 23,429, 2PM's "2PM Member's Selection" with 20,000 and A Pink's "Une Annee" with 16,816. In the monthly singles chart for May, "Twinkle" is also No. 1 followed by IU, Baek Ji Young feat. Gary of Leessang, Ulala Session, IU, SISTAR, Park Jin-young, Brave Guys, Mighty Mouth and Baek Ji Young feat. BEAST's Junhyung.